Bring a portable speakerphone to a remote workspace or conference room with the Calisto 3200 USB Type-C Speakerphone from Plantronics. 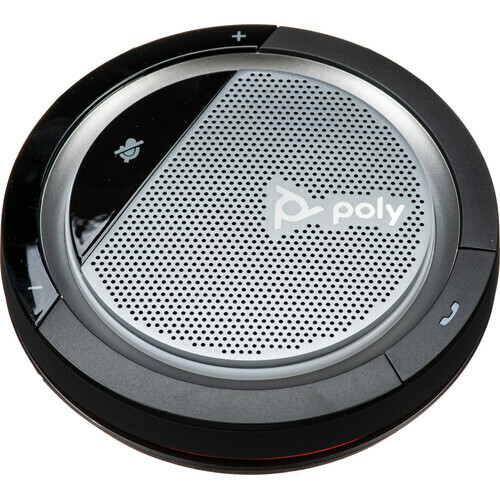 Equipped with an attached USB Type-C cable, this full-duplex speakerphone boasts a 360° microphone, active background noise reduction, wideband audio support, digital sound processing (DSP), and one-touch calling, mute, and volume controls. Compatible with USB Type-C-equipped Mac and Windows PCs, the Calisto 3200 draws power from its USB cable and doesn't need a separate power cable. The speakerphone supports unified communications applications and softphones from Avaya, Cisco, IBM, Microsoft, and more. Calisto 3200 is designed to provide exceptional audio quality from up to 10' away, and it meets Microsoft Skype for Business specifications for group conferencing. A voice alert lets you know if you try to talk on the speakerphone while it's muted. Includes cable management, plus a soft carrying case for easy storage and portability. The Calisto 3200 turns on automatically whenever it's connected. Clear controls and visual indicators for call, volume and mute let you manage what you hear and how you sound. Multi-language voice alerts keep you informed of your call status. Calisto 3200 is supported by Plantronics Manager Pro, a software-as-a-service that is sold separately. Use Plantronics Manager Pro to manage headset inventory, monitor usage and maintain devices. Choose the settings to customize your headset with the Plantronics Hub software utility for desktop. Select language preference, feature settings, call and mute notifications. Keep your device up-to-date with Plantronics Hub firmware updates. Box Dimensions (LxWxH) 7.5 x 5.9 x 2.3"